The LEKI Speed Pacer Vario combines the advantages of a fixed length pole with those of a telescopic one ingeniously: the pole is infinitely telescopable in 10 cm right under the handle. Thus, the pole can be individually adjusted to the appropriate length with respect to a sporty or less sporty use. 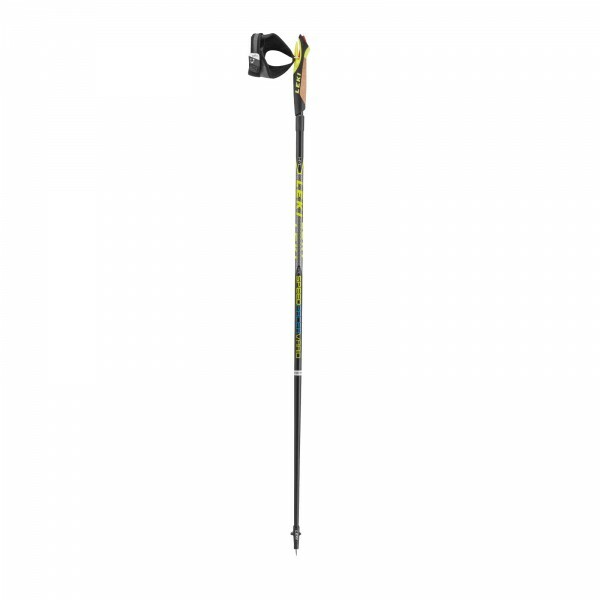 The carbon shaft of the LEKI Speed Pacer Vario ensures a high stability and still low weight. In addition, the LEKI Speed Pacer Vario stands for a high flexbility thanks to the systems Super Lock and Trigger Shark. The comfortable, individually adjustable strap of the LEKI Speed Pacer Vario is easy to remove from the handle thanks to the Trigger Shark system - to offer such freedom like always grasping the drinking bottle without having to remove the strap. The self-explaining Super Lock adjusting system offers highest holding power of 140 kg and high reverse rotating safety of more than 360°. The Speed Tip provides a precise use no matter on which ground. The Silent Spike Pad with its 6 integrated spikes offers optimal grip on firm and loose ground. Thus, the pole is optimal for ambitious and sporty Nordic Walking. Für den Preis gibt es kaum etwas besseres. Super leicht und tolles Verschluss-/Spitzensystem.